FRANK CHEW was born in San Francisco, the third of four sons and two daughters in a working class family. For health and other reasons his father, once a chef, moved the family to Hong Kong. In Hong Kong, an adolescent Frank and his peers were witness to the enormous upheavals of that region and period: war, famine, and revolution. “My friends and I became determined to alleviate the suffering of the common people.” Frank says. KATHERINE LIANG CHEW was born near the southern Chinese city of Nanning, the second of six daughters and 12 brothers in a family of distinguished writers, scholars, and artists. “Although our family had become prosperous (by trading spices and tung oil) my father often remarked that our wealth came from people who worked the soil,” Katherine says. 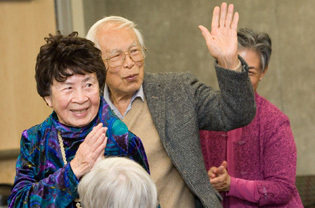 “Our gift to establish the CHEW-LIANG PROGRAM closes a circle. China’s recent successes are breath-taking, but ultimately they still rest on the toil of peasants. The Chew-Liang program embodies our modest attempt to keep this realization at the forefront for the next generation of scholars and practitioners,” says Frank. 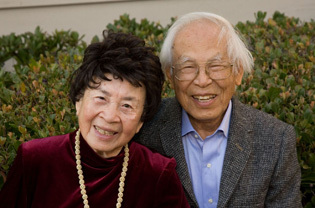 KATHERINE and FRANK CHEW both attended UCLA. Katherine subsequently earned an MLS (Louisiana State University), and Frank a PhD (University of Miami). In retirement, they live in Irvine, California. All three of their children are university faculty members. 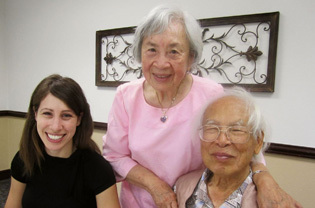 Pictured: Award recipient Lauren Grabowski with Dr. and Mrs. Chew.